(1) To show examples of the type of damage that can be present in corroded 2024-T3 lap joints and (2) to illustrate the process for determining the equivalent initial flaw sizes for corroded fuselage lap joints. This problem focuses on the methods to determine the equivalent initial flaw sizes that can be used to carry out a damage tolerance assessment of corroded fuselage lap joints. To differentiate the use of the EIFS concept in a corrosion fatigue situation, the phrase Equivalent Corrosion Damage (ECD) is used. A study was carried out on dog-bone coupons fabricated from naturally and artificially corroded lap joints. These coupons were subjected to a cyclic load and the fracture surfaces were examined with the aid of a scanning electron microscope to determine the location and size of the nucleation site. Also, using x-ray techniques to map the thickness loss in these coupons as well as in corroded lap joints that were disassembled and cleaned of corrosion products, the coefficient of variation, which is a measure of the scatter, was determined. This problem focuses on one of the critical areas in transport aircraft, lap joints, which can be of various designs usually consisting of two or more layers of material with two or three rows of rivets, Figure NRC-1.1. These joints are known to be susceptible to crevice corrosion, which is a form of attack that occurs when a corrosive liquid gains access to crevices in, or between components. Studies have shown that the corrosion products which form in lap joints fabricated from clad 2024-T3 aluminum material have a molecular volume of approximately 6.5 times greater than the aluminum alloy from which it originated (Bellinger et al., 1994). This increase in volume causes the skins between the rivets to bulge, an effect referred to as pillowing, Figure NRC-1.2, and is often used by inspectors to identify areas in lap joints affected by corrosion. 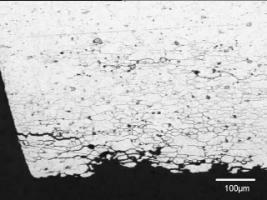 Damage characterization studies that were carried out on naturally corroded lap joints have shown the presence of corrosion pits, exfoliation, intergranular corrosion and environmentally assisted cracking, which occurred in the presence of a sustained stress caused by corrosion pillowing, Figure NRC-1.3 (Bellinger et al., 1999). It should be noted that very few large pits were found in the lap joints that were studied although some areas had an average thickness loss of 20% or higher. Those large pits that were found occurred in an area that contained very little corrosion damage other than the pit. 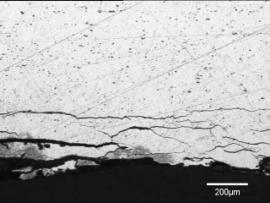 The presence of intergranular corrosion and exfoliation may explain why there were very few large pits given the high thickness loss. As the intergranular corrosion or exfoliation progressed causing pits to link-up to other edges, the material between the pits could be removed by way of flaking or dissolution decreasing the existing pit depths. This, in turn would cause the remaining damage to appear less severe although the average thickness loss would be higher. ECD values can be determined either by examining failed corroded lap joints or by conducting tests on coupons fabricated from corroded lap joints taken from in-service or retired aircraft. Ideally, the tests should be carried out using stress levels similar to that experienced by lap joints in service. Prefabricated lap joints artificially corroded in a salt fog chamber may also be used if the resulting ECD values are similar to those determined from naturally corroded joints (that is the damage produced by the artificial process is similar to those produced by the natural process). This example addresses this issue (Bellinger et al., TBP; Bellinger et al., 1999a). Since ECD values are material dependent, any lap joint configuration can be used in the artificial process. However, it should be emphasized that only lap joints should be used and not just single sheets of material since crevice corrosion results in a more severe attack than just pitting corrosion. The fabricated joints were placed in a salt fog chamber and subjected to a modified copper assisted salt spray (CASS) process. 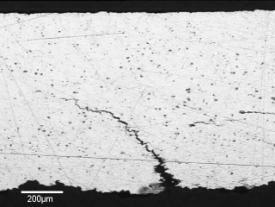 The joints were periodically removed and inspected using the enhanced optical inspection technique, D SightTM and multi-frequency eddy current techniques to estimate the average thickness loss (Komorowski et al., 1991; Forsyth et al., 2000). Once the desired thickness loss was achieved, the joints were removed from the chamber, disassembled and the corrosion products removed using a chemical/ultrasonic process. Studies have shown that the damage produced by the artificial process was similar to that produced by the natural one (Eastaugh et al., 1999). One of the main problems in generating ECD values is the design of the test coupon since the majority of the lap joints consist of 2024-T3 clad aluminum material, 1.27 mm (0.05 inch) thick. The ASTM E466-96 standard was used to design a coupon since it did not place any restriction on the specimen dimensions. The coupons were machined such that the loading axis was perpendicular to the material rolling direction as shown in Figure NRC-1.4. Figure NRC-1.4. Schematic Showing Test Coupon Configuration And Photograph Showing Orientation In Lap Joint Used For This Problem. Using thickness maps developed from radiographs of the coupons, the thickness in the gauge length of each coupon was determined. Based on these results, ten coupons from the naturally corroded skins and twenty from the artificially corroded ones were machined such that the average thickness loss in the gauge length was approximately 2%. Coupons were also machined from both the naturally and artificially corroded skins so that the average thickness loss within the gauge length was 5%. 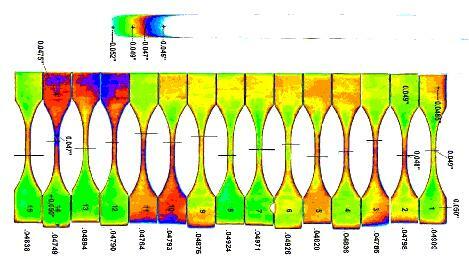 Figure NRC-1.5 shows the x-ray thickness maps for the coupons fabricated from the naturally corroded lap joints. All tests were carried out under load control in a servo-hydraulic load frame with hydraulic grips. 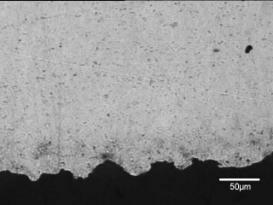 Given the effect that humidity has on the fatigue life of aluminum alloys, the relative humidity was recorded throughout the duration of the test. Each coupon was subjected to cyclic loading until failure with a load ratio of 0.02 and a test frequency of 10 Hz. The maximum load was adjusted for each coupon to maintain a maximum stress level of 207 MPa (30 ksi) in the gauge length area. This stress was the approximate value that the lap joints experience in the vicinity of the critical rivet hole where multi-site damage occurs. To prevent premature failure at the corners, the edges of each coupon in the gauge length were broken using a machinist sanding stone. The average number of cycles to failure and the standard deviation for each set of results is shown in Table NRC-1.1. The combined average number of cycles to failure for the 5% corroded test coupons is shown in this table along with the average value for the artificially and naturally corroded 5% results. The total number of coupons tested for each condition is also given. To determine the ECD values for the different test condition, the majority of the fracture surfaces for the 2% artificial and natural coupons were examined with the aid of a scanning electron microscope (SEM) while values for the 5% coupons were determined by back-calculations. 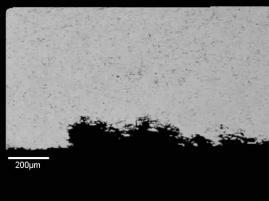 All the nucleation sites found using the SEM were semi-elliptical in shape and the majority of the sites were located along the corroded surface (faying surface of the joint). It should be pointed out that the coupons did not always fail at the thinnest area of the gauge length or at the maximum pit depth as shown in Figure NRC-1.5 by the black lines, which indicated where the coupons failed. For those coupons that did not have a single nucleation site, different scenarios were used to obtain the ECD value. The average semi-elliptical ECD values that were measured with the aid of a scanning electron microscope for the 2% artificial and natural coupons and the calculated average semi-circular ECD value for the 5% combined coupons are shown in Table NRC-1.2. The resulting ECD numbers can then be used to predict the residual life of corroded lap joints, which is demonstrated in a separate example. Bellinger, N.C., Krishnakumar, S. and Komorowski, J.P. (1994), Modelling of Pillowing Due to Corrosion in Fuselage Lap Joints, CAS Journal, Vol. 40, No. 3, September 1994, pp. 125-130. Bellinger, N.C., Komorowski, J.P. and Benak, T.J. (TBP), Residual Life Predictions of Corroded Fuselage Lap Joints, to be published in the International Journal of Fatigue. Bellinger, N.C., Cook, J.C. and Komorowski, J.P. (2000) The Role of Surface Topography in Corroded Fuselage Lap Joints, to be published in the proceedings of the 2000 USAF Aircraft Structural Integrity Program Conference, December 5 to 7, 2000, San Antonio, Texas. Bellinger, N.C., Benak, T.J., Chapman, C.E., Komorowski, J.P., Scarich, G., and Falugi, M. (1999a), Equivalent Corrosion Damage Methodology for Corroded Fuselage Lap Joints, Published in the proceeding of the 1999 USAF Aircraft Structural Integrity Program Conference, San Antonio, Texas, 30 November  2 December 1999. 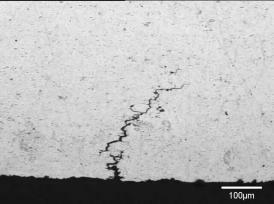 Bellinger, N.C., and Komorowski, J.P. (1999b), Environmentally Assisted Cracks in 2024-T3 Fuselage Lap Joints, Published in the proceeding of the Third Joint FAA/DoD/NASA Conference on Aging Aircraft, Albuquerque, New Mexico, September 20-23, 1999. Eastaugh, G.F., Merati, A.A. and Simpson, D.L. (NRC), Straznicky, P.V., Scott, J.P., Wakeman, R.B. and Krizan, D.V. (Carleton University) (1999), An Experimental Study of Corrosion/Fatigue Interaction in the Development of Multiple Site Damage in Longitudinal Fuselage Skin Splices, RTO-MP-18 AC/323(AVT)TP/8 March 1999, proceedings NATO-RTO Air Vehicle Technology Panel Workshop on Fatigue in the Presence of Corrosion (Fatigue sous corrosion), Corfu, 7-8 October 1998. Forsyth, D. S., Fahr, A., Chapman, C. E., Bellinger, N. C., Komorowski, J. P. (2000) NDI Capabilities for Airframe Corrosion Damage Tolerance, in the proceedings of the 2000 USAF Aircraft Structural Integrity Program Conference, December 5 to 7, 2000, San Antonio, Texas. Komorowski J.P., Simpson D.L., Gould R.W. (1991), Enhanced Visual Technique for Rapid Inspection of Aircraft Structures, Materials Evaluation, December 1991, pp. 1486-1490.